We were a bit behind schedule now, so Scott arose early and uncovered the faint path that would lead to Cartidge Pass. We climbed steeply up the switchbacks, occasionally losing the trail but not for long. It stopped at a talus pile, but after a dead-end or two we found it traversing west to another set of switchbacks. 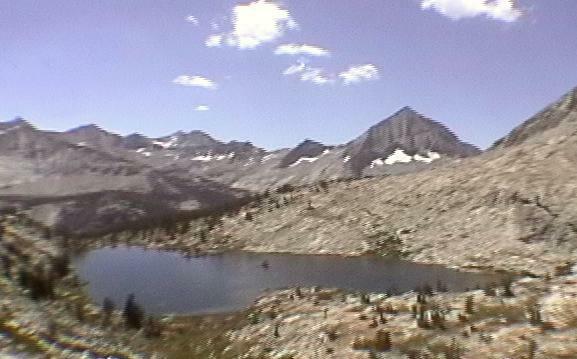 We finally reached the pretty lower lake, where the trail eluded us again. We regained it above the lake, and more hard climbing brought us to the summit. The view south was extremely pretty, with Pyramid and Arrow peaks standing out against the sky (which was again filling with cumulus clouds). The north view could be called a disappointment in comparison: the tall peaks showed little character on their south sides, just long slopes of talus above the highest Lake Basin lakes. We found the north side trail to be as bad as DW had described - a long, steep slope of rock and gravel that had been carved into many paths of dubious quality. Many people had gone straight down, which damaged the more relaxing switchbacks and made all routes more challenging. We finally made it to the first lake, where we encountered our camp-mates from Taboose. They had reached the first lake on the south side the previous night but were exhausted, so we were able to catch them this day. We spoke a while, bid them farewell, and immediately lost the trail. We veered right in search of it, but apparently crossed it during a faint stretch and found ourselves well to its north. Since our route to Dumbbell Pass required us to go north the next day, that was no real problem! Scott led us down a steep wall to the northern L-shaped lake in the basin, and we found a great camp near the lake. This evening actually had thunder, but no raindrops interrupted my dinner for once.